Spydercrane / Track-O - Encore Trucking & Transport Ltd.
Encore Trucking & Transport is Western Canada’s main distributor of UNIC Spydercranes. Encore Trucking was the first to bring these Spydercrane units into Canada back in 2008 and has been using, renting and selling them since. 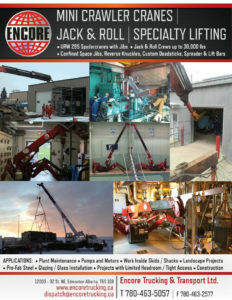 We have the most experience and knowledge with these units in all of Canada. Being only 2 ft wide and 9ft long in transport mode, our mini crawler cranes can get into those tight spots where you need power and lift. This mini crane has proven to work well in almost any environment. The size of the machine enables greater accessibility but does not compromise with power (lift to 3 tons) or boom length (28 ft) and has 360 degree swing capability. The crane is mounted on tracks for travelling within minutes to where the work is. With 6 positions for each of the 4 independent outriggers, there are numerous configurations to set up the crane, giving it the ability to adapt to almost any situation. For indoor lifts, there are hybrid models available such as gas/electric, gas/propane and straight propane. For outdoor work, there are straight gas and straight diesel units available. Encore Trucking also carries the Track-O. This is a motorized electric stair-climber and all terrain dolly. These units are perfect for transporting items around a job site and moving loads up and down stairs. Depending on the model, these units can have up to 2,200 lbs of carry capacity on flat ground or 1,100 lbs on incline. They are the ideal mobile hand truck at just under 30 in wide with the ability to be fully remote controlled to reduce the risk of injury. Encore rents these units for client use or with full operator service.